Kenya Airways (KQ) has started selling tickets for non-stop flights between Nairobi’s Jomo Kenyatta and New York’s John F. Kennedy airport that will start on October 28, ahead of the 2018 US winter season. The ultra-long flights from JKIA to JFK (15-hour KQ002 23:25 – 06:25 next day) and return leg (14-hour KQ003 12:25 – 10:55 next day) will be operated using two Boeing 787-8 Dreamliners, and an extended crew of 4 pilots and 13 flight attendants on each leg. KQ Chairman, Michael Joseph said this was a significant event after long planning and extensive interaction with US authorities (11 different agencies in the US are involved) while CEO Sebastian Mikosz said that they were targeting two main groups of flyers – corporate (48 US companies and international organizations that have their regional hubs in Nairobi) and premium leisure tourists (the USA is a top tourist source for Kenya that had 95,000 visitors between January and October in 2017, which was a 20% increase over the last two years). Kenya Airways is investing heavy with daily flights to New York (85,000 seats each way per year) that they estimate will have significant uptake, similar to the airline’s current routes to Europe (~85% loads) due to the attractiveness of non-stop flights between Nairobi and New York and they expect that the USA flights will constitute up to 10% of the airline’s revenue after 2019. The KQ Boeing Dreamliners seat 234 passengers – 30 in business class (tickets start at $2,499) and 204 in economy class (tickets start at $869). In future, the airline will take back two other B-787 from Oman Air when the leases expire in 2019 and they also plan to sign a joint venture code-share with Delta Airlines in 2019 to expand the sale of tickets in the USA beyond New York. This entry was posted in 787, Boeing, Kenya Airways, Kenya economic growth and tagged JKIA on January 11, 2018 by bankelele. On Thursday, Kenya government officials, led by the Cabinet Secretary for Transport announced that Kenya has been granted Category 1 Status by Federal Aviation Administration(FAA) of the USA. This followed extensive renovation work at the JKIA airport in Nairobi and other aviation improvements. The elevation by one US aviation authority is a welcome step, but it is part of a process towards getting to direct flights, and there will still be more security checks, permissions, and deals to be done with airlines and airports before this comes to fruition. The last direct flight attempt in June 2009 was halted by the US Department of Homeland Security. The Kenyan Transport minister had even traveled to the US to be on an inaugural flight only for it to be canceled at the last-minute. Delta had planned four flights a week to Nairobi, with a stop in Dakar, Senegal. The announcement could be a boost for Kenya Airways (KQ), but the initial focus which they have maintained over the years when asked about the US, is to pursue a code-share partnership, perhaps with Delta Airlines. Under the ongoing KQ restructuring project Operation Pride at the airline, code-shares which involve selling their tickets on partner airlines gets them revenue without having to deploy aircraft. But once partner flights start, national prestige will force KQ to step in and do the flights themselves. They have the equipment, Boeing 787’s ‘Dreamliners’ that are perfect for direct US flights. The first Dreamliner for Kenya Airways, April 2014, flew from the Boeing factory on the West coast of the US on a non-stop a 16-hour flight to Nairobi, and expectations are to have much shorter flights from the eastern coast of the US, likely to be Washington DC or New York. After all, rival Ethiopian Airlines flies to five North American destinations, and there are ample numbers of Kenyans and US tourists and cargo in both directions to justify KQ flights. Perhaps once KQ gets back the Boeing 777-300’s leased out to Turkish Air. 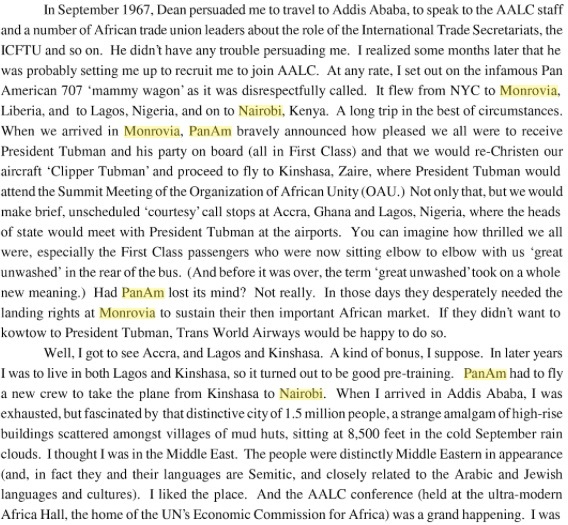 The last direct flights to the US were on defunct Pan Am, which TV anchor Jeff Koinange who briefly worked as a flight steward on Pan Am and he describes the flights in his autobiography “Through My African Eyes”. 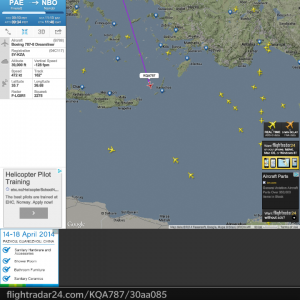 That flight appears to have been New York-Dakar-Monrovia-Lagos-Nairobi with a Boeing 747. 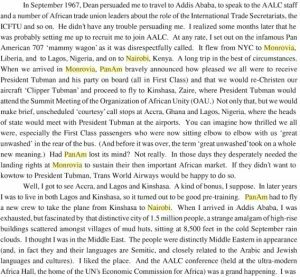 Pan Am flights to Africa were rather interesting, as this excerpt from “Life Is an Excellent Adventure: An Irreverent Personal Odyssey”, by Jerry Funk, shows. EDIT: In its application documents, Kenya Airways estimated that approximately 60,000 passengers will be transported within the first year of non-stop service. Sept 8 EDIT: On September 5, 2017, The US of Department of Transportation awarded Kenya Airways PLC with a foreign air carrier permit to engage in: Scheduled and charter foreign air transportation of persons, property, and mail from any point or points behind Kenya, via any point or points in Kenya and any intermediate points, to any points or points in the United States and beyond. and The holder shall also be authorized to engage in other charter trips in foreign air transportation, subject to the terms, conditions, and limitations of the Department’s regulations governing charters. EDIT: Jan 10, 2018: A Daily Nation newspaper story reported that Kenya Airways will start daily direct flights to New York in October. Ticket sales will start on January 11. 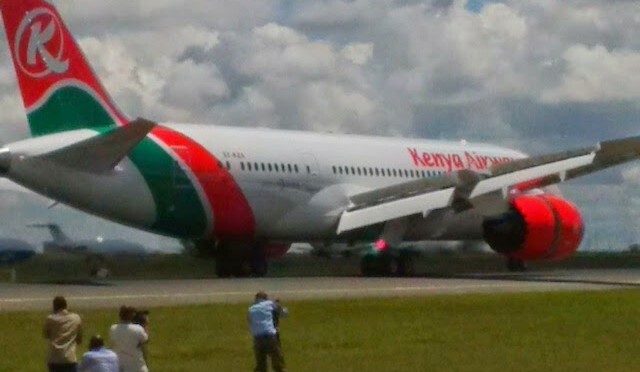 Flights will be on KQ’ Boeing 787 Dreamliner, leaving Nairobi at 10:30 p.m. to land at JFK at 6:30 a.m. and depart New York at 1:30 p.m. to arrive in Nairobi at 10:30 a.m. the following day. This entry was posted in 787, Boeing, Kenya Airways, Kenya economic growth and tagged JKIA on February 25, 2017 by bankelele. Close the profit gap (and get the airline to a 5% after tax return). Item 3 is really about the shareholders (which includes the Government of Kenya – as a shareholder and regulator, and KLM) making balance sheet, debt and equity decisions. KQ has already secured $200 million from through an on lending agreement with the Kenya government, and got the first $100 million in September 2015, and the rest of it this month – in July 2016. And while the move to layoff some pilots and other staff (once other discussions with court and the unions are resolved) , Operation Pride is not about jobs. 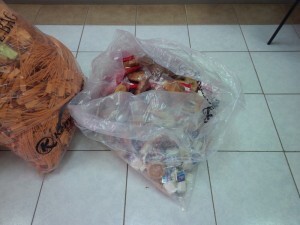 It also more than cutting on costs without compromising quality and waste without reducing service. Operation Pride started out as 460 initiatives that mainly came from suggestions from staff, consultants and stakeholders to improve the business. KQ staff will champion these as they are implemented over the next 18 months, and expected to generate about $200 million. About 40% of the impact will be from cutting costs and about 60% will be from growing revenue at the airline. Removal of 7 large aircraft will this will reduce KQ fleet costs by about $8 million per month. They were largely idle, and some have been sold, and others leased (3 777-300’s to Turkish) and (2 787’s to Oman). KQ is still able to serve all their existing routes (with about 60 weekly flights outside Africa) with the smaller fleet of 36 active aircraft. The Heathrow deal in which they combined and sold two different time slots in conjunction with Air France raised a record amount. They had previously served London with night flights, but which meant a plane sat idle the whole day in London. Now they only need one aircraft and lease a slot from KLM , which means an (almost) immediate turnaround. Improved incentives to agents, who still generate 70-80% of the ticket sales. Adjusting flight times: E.g between Lusaka and Dubai, they can fly passengers at an attractive price and the total journey is just now over one hour longer, even with a stop-over in Nairobi, than the direct Emirates flight. New routes in Africa, the Middle East, and China through new code-sharing partnerships (category one status for JKIA will also mean that they will be able book tickets to the US for flights on partner airlines). This is essentially a redesign of Project Mawingu a decade ago in which KQ set out to fly many new routes by themselves. (A system that can?) React to try to match different over 1,000 ticket prices combinations every day. Use new hotels in Nairobi that offer good services and buying packaged deals from overseas hotels. Re-negotiating handling contracts as a result of smaller aircraft. 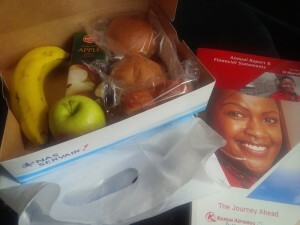 Revising inflight meal service – serving lighter meals to reduce waste, and removing beverages that were not popular. Controlling and reducing staff travel. This entry was posted in 787, afrexim, Investing in Kenya, Kenya Airways, london, NSE investor awareness and tagged KenyaAirways on July 22, 2016 by bankelele. 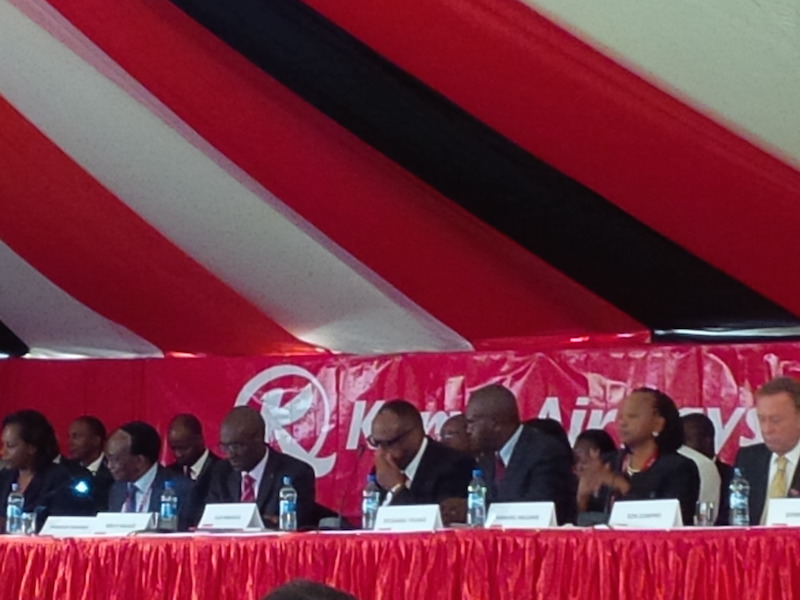 The Kenya Airways shareholders 2015 annual general meeting (AGM) was held at the KQ Pride Centre, Embakasi on Friday October 9. This was on the back of the year in which they lost (a corporate record) Kshs 25.7 billion ($257 million). Board Changes (in the calendar year): In: Mbuvi Ngunze (CEO), Carol Armstrong, Wanjiku Mugane Out: Titus Naikuni (CEO), Ayisi Makatiani, Dinesh Kapila and the Chairman Evanson Mwaniki who had announced he was stepping down ahead of the AGM by not seeking re-election. He said he was not running away from problem but it was time to give someone younger the chance. At the end of the meeting, there was re-election of directors to the board, and while 5 had applied, 3 of them had since dropped out leaving Jason Kapkirwok (a former KQ strategy director) and Dennis Awori (current board member) as the only two names for the two vacancies on the board. The meeting was quite routine, ahead of the Q&A. After the auditor read his statement, which included an emphasis of matter (relating to the loss), the chairman invited KQ CEO Mbuvi Ngunze to give a brief on the state of the airline which he (Mbuvi) said was operationally sound, but had financial challenges. He asked Kenyans to rally behind airline, as the staff are committed. Dubai and Ethiopia had aligned their hubs with airline and cities, but Kenya had not. KQ has sold older Boeing 767 and 737, aircraft, but deals to sell the 777-200 fell through twice, and they have since hired an agency to complete this. Seabury have been appointed to improve pricing and airline processes. They have appointed financial advisor to secure $200 million and negotiated credit with local banks and patient supplies, as well as short-term loans from government of Kenya, and KLM has also provided some finance. 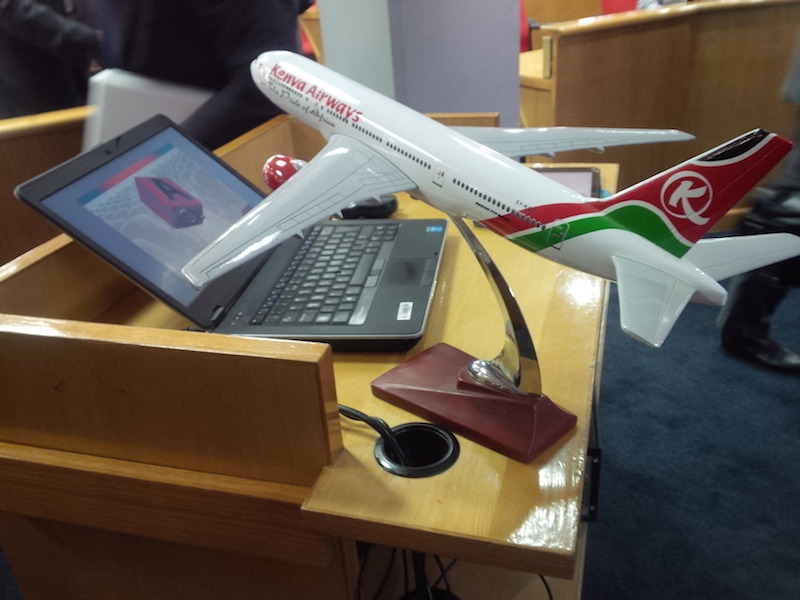 Asked about the loss, finance director, Alex Mwangi said, in short, they invested in the fleet, but revenue did not grow to match the increased fleet expenses (6 new 787’s now, and 3 new Boeing 777-300 this year). He also said the aircraft buy decisions were made back in 2005 – even before Chairman Mwaniki (longest-serving director) joined the board. One shareholder said the Kenya government should not give the board Kshs 60 billion, but instead jail the managers who were being investigated by the senate and get new auditors. Mbuvi said they are cooperating with senate who say they have a constitutional right to ask questions. PS Kamau Thugge said that with the visits by President Obama, the Pope, the WTO summit and the lifting of advisories, the outlook was good for KQ. He reiterated that the government was not broke as written in the media, and that they had already lent Kshs 4.2 billion to the airline, and facilitated the Afriexim funding. What’s the use of KLM? Mbuvi said KLM is a commercial and shareholder partner on North-South routes and this has allowed KQ to focus on Africa where 60% of their revenue now comes. They also have 20 other partnerships. Did Ebola really impact the results? Mbuvi said the Liberia and Sierra Leone routes generated closes to $4 million per month and the airline lost about $31 million in two weeks . One shareholder was concerned that management is too optimistic. Last year they talked nicely after the airline lost money, only to come back this year and find that the position was even worse. He said they had also been sweet-talked by boards at Uchumi and National (bank) as the companies went down and wondered if KQ would be around next year. One complained about, in the digital era, shareholders don’t get to see annual reports, till they arrive at the AGM . One shareholder who’s a frequent flyer and trader on the China route commended the switch to new Boeing 787’s, from the old 767’s which would break down often in China resulting in extended expensive hotel stays for passengers and crew. He also said that Kenyans were lucky to have an airline, and that other African travelers depended on KQ. Some shareholders complaints were contradictory; one asked for the meeting to be held in Mombasa, and another asked for bus fare to be refunded. One complained about high ticket prices, then later complained about having to buy water on JamboJet (KQ’s no frills carrier). She also complained about kids been separated from parents in-flight (an international airline rule?) and also asked the airline not to use prominent people like Chris Kirubi and Charles Njonjo (who crew would salute) in their adverts, but instead have ordinary passengers talk about their airline experiences. This entry was posted in 787, AGM, Kenya Airways, NSE investor awareness and tagged KenyaAirways on October 12, 2015 by bankelele. 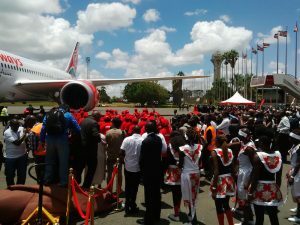 On April 5, Kenya Airways (KQ), received The Great Rift Valley – their first Boeing 787-8 Dreamliner aircraft in Nairobi. 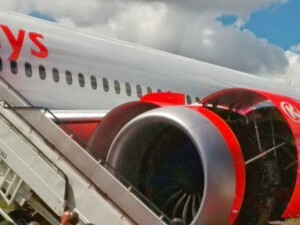 KQ Managing Director, Titus Naikuni, said their aircraft were 3-4 years behind schedule and thanked the airline staff, passengers and salespeople for putting up with older aircraft in the interim. He added that plans are still on course for KQ to get more Dreamliner planes every month between June till October 2014. KQ Chairman, Evanson Mwaniki who was onboard the 16-hour non-stop flight from Paine Field, Washington to Nairobi, said they been assured at the highest levels of Boeing that the 787 program’s teething problems had all been sorted. He said each Dreamliner with engines cost the airline Kshs. 11 billion (~$130 million seems low), while the new Boeing 777-300’s arriving were Kshs 18 billion ($211 million) and yet they are competing for routes with Gulf nation carriers with seemingly unlimited pockets who could order 100 aircraft while KQ ordered 9. He made three requests of the Government; to expedite bilateral air service agreements, sort out double taxation that penalizes the airline and also expedite VAT refunds. Transport Cabinet Secretary, Engineer Kamau said the government of Kenya and KQ had worked on new terminals (Greenfield started, Terminal 4 ready in July), and new aircraft (777, 787) and invited the President to use Kenya Airways for trips and for KQ to use the President who travels a lot and get themselves on his agenda for such trips. Also at the launch was the President of Somalia, Hassan Sheikh Mohamoud, who said terrorism was a global challenge and that, while Shabaab was associated with Somalia where it gained a foothold in the then-lawless state, it is now losing ground in terms of financing, recruitment, and training. He thanked Kenyans for their tolerance and accommodation of business people and said Somalia was on track for a first election in 45 years in 2016 in which women would also vote. 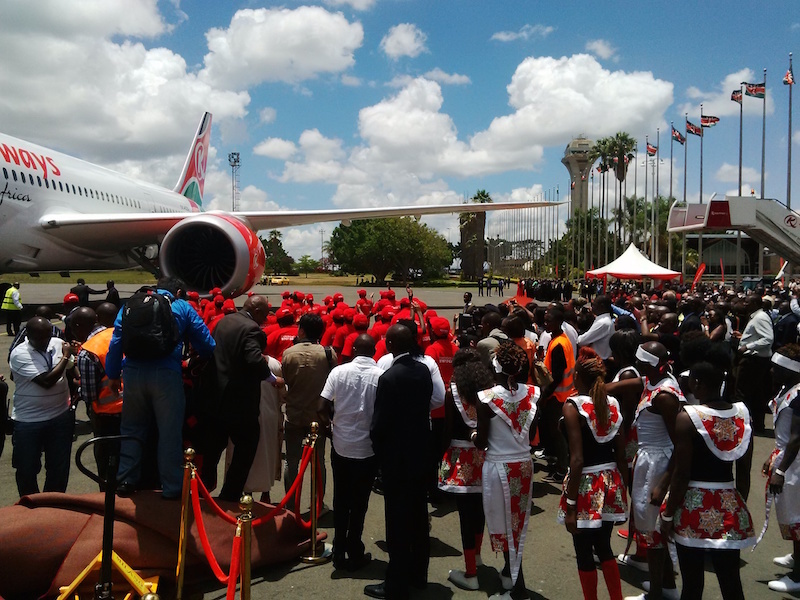 President Kenyatta said KQ had more of a global reach than Kenya embassies so was in essence first ambassadors for the country and that in his personal experience it had the best pilots and crew in the world. Later he noted that pilot costs are heavy, and that KQ’s labour is less productive than Ethiopian Airlines and that it was necessary for the airline to simplify operations and get better staff productivity. He also said that Angola had agreed to open an embassy in Nairobi – a relief to many as Kenyans applying for visas have to do so via Dar es Salaam, Tanzania. The new aircraft is part of Project Mawingu, the airline’s massive fleet, and route expansion program. It will start on the Paris route in June and in between will be used for familiarization of staff, training, and be showcased to key KQ markets. At the launch, a General Electric representative thanked the airline for having over 100 of their engines in the fleet, while a Boeing VP said KQ had designed and selected one of the best Dreamliner interiors on offer. This entry was posted in 787, Boeing, Kenya Airways on April 6, 2014 by bankelele.